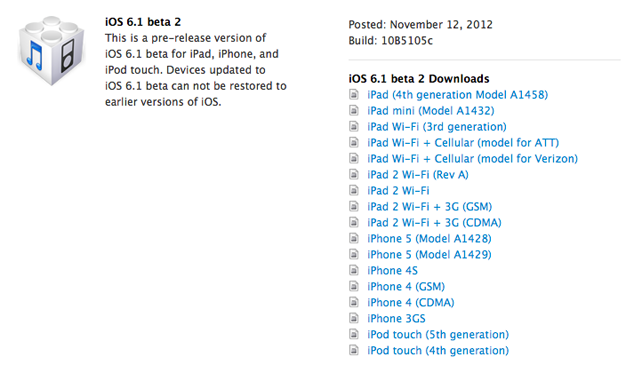 Apple has just released iOS 6.1 beta 2 (build 10B5105c) to developers this morning. At this time it is not known what changes or additions are present in iOS 6.1 beta 2, but we will be sure to update you when more information is available. In the first beta of iOS 6.1 it was discovered that there would be movie ticket purchasing support within Siri, and improved in-maps searches. Along with the iOS 6.1 beta 2 firmware Apple has released Xcode 4.6 Developer Preview 2 and new firmware version for the Apple TV. You can find the changelog for iOS 6.1 beta 2 below. When browsing the iTunes Store, TV Shows is missing Networks, Genres, and Genius from the top menu. The Top Movies and Top TV Shows grids are missing the featured carousels, as well as several featured shelves. In iOS 6.1, the Map Kit framework introduces the MKLocalSearch, MKLocalSearchRequest, and MKLocalSearchResponse classes. Apps can use these classes to perform map-based searches for addresses and points of interest. The results are then delivered to the app as an array of map item objects. For information about these new classes, see Map Kit Framework Reference. In iOS 6.1, a new Reset Advertising Identifier button has been added to Advertising Settings. This button resets the Advertising Identifier so that future requests will return a different value. This release does not support testing In-App Purchase in iOS Simulator. For apps that use this feature, please test on a device. Weibo shows up in the Settings app only if a Chinese keyboard is enabled. If you are a registered iOS developer you can download iOS 6.1 beta 2 from the iOS Dev Center. Let us know if you discover any additional changes in the comments section below. Scrolling Is Backwards (Reversed) In Mac OSX Lion - Here's The Fix!